Editor’s note: Rowan’s exhibition celebrates its opening this Thursday, November 3rd, at 6pm at Birch Coffee on the Upper West Side. More info here. See more of Rowan’s art on her instagram and website. What do we do for our own sake? Binge watch all of Westworld in a single weekend, eat an entire box of mac and cheese in one sitting, major in nonfiction? Few of us can say that we are truly productive in these actions. Sure Netflix may be comforting and relaxing, but how good is it for us actually? 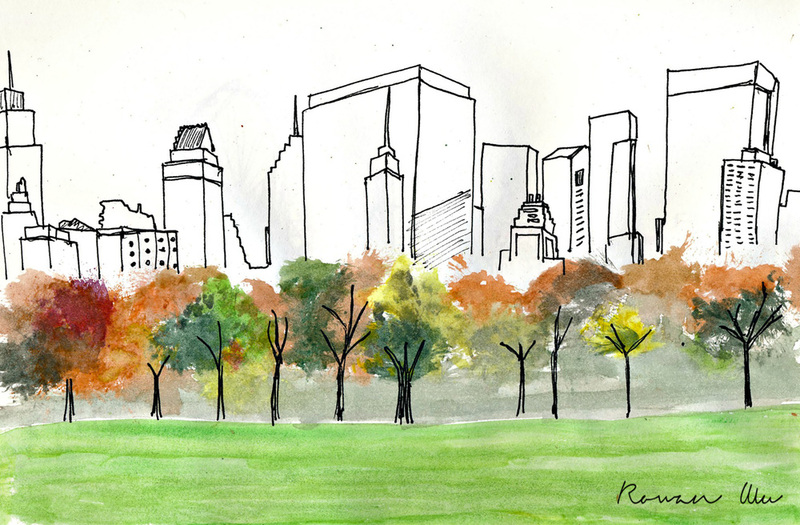 Rowan Wu (www.rowanwuart.com), an Urban Studies major at Barnard, devotes herself and her spare time to her art. Not for credit, not for followers, but for herself. “I’m just doing what I love,” Wu says with a shrug. 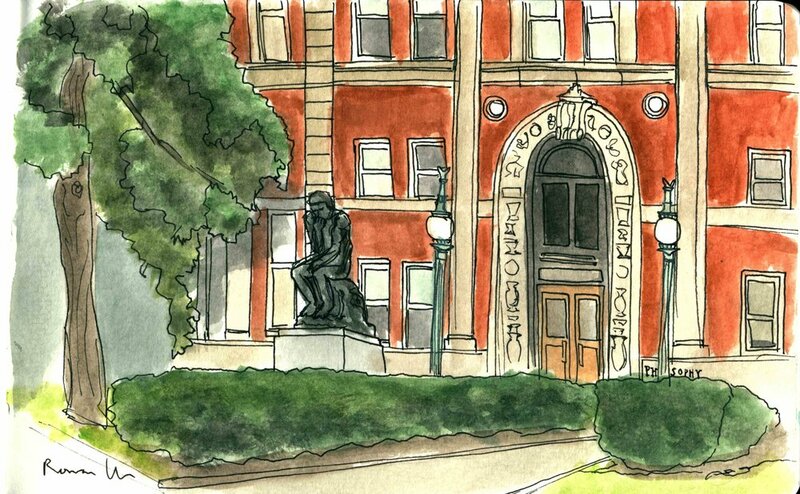 To her, painting is a natural response to the mounting pressure put on a college junior. 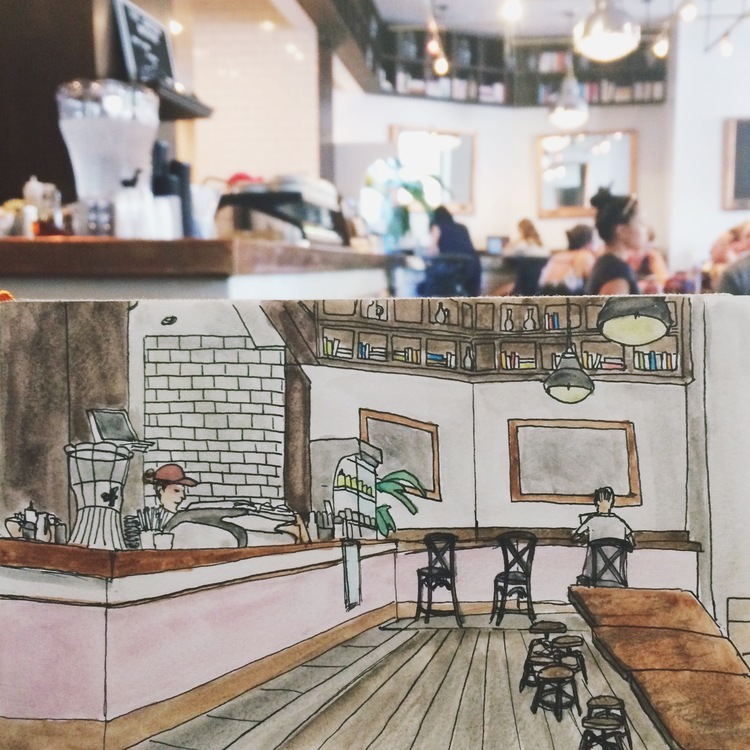 To counteract that stress, Wu spends hour blocks perched in cafes or on steps, trying to conjure in watercolor “the creative spirit” of her subjects. “I’m just doing what I love,” Wu says with a shrug. How does she determine what or where that soul is? It comes down to “what resonates with [her].” Most recently, this has equated to simply: “All the parks.” Everyone loves a lazy afternoon on the lawn, but why such enthusiasm for such a specific subject? “I worked for Central Park.” Wu explains, having interned there during the summer. She worked in The Bramble, learning not only about park management, but also about the types of trees around her. This is where Wu learnt horticulture and the names of what she was sketching. 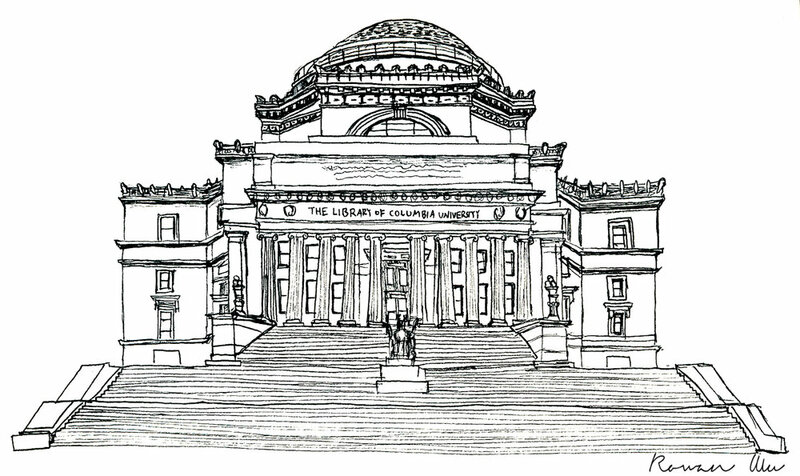 Her internship in conjunction with her studies led to Wu’s interest in New York’s green spaces, its “smaller squares,” and “how [its] people care for outside spaces for themselves.” She became intrigued by the urban history of New York and finds it increasingly “rewarding to learn about [the] growth of city” in both her academic as well as artistic pursuits. With these goals in mind, Wu began “pretty simply.” She didn’t see herself as anything but as “an observer, a part of a whole living here.” With a keen, yet thoughtful eye, Wu began to capture the city and city life in whimsical watercolors, trying to encapsulate “the liveliness of living in [the] city” into her paintings. With a summer full of “so much inspiration” and sketchbook brimming with paintings, Wu began posting to Instagram. Amongst her friends, her newfound enthusiasm in art was met in some cases with the somewhat tired response of, Oh! Draw me! Although some of her work does include people, Wu owns up that, “I don’t love portraits. You can’t fudge detail[s] with people.” Wu points to the rough shapes that, together, equate to a cityscape on the page. “People still recognize a building.” Focusing on buildings and scenes, Wu slashed lines that together until they formed Yankee Stadium, Washington Square, Jacob Riis Beach, The Dakota, Grand Central Station and other iconic sites. It was “not about technical skill” or “efficiency and accuracy,” but rather “about the personal pursuit.” Still figuring her Art out, Wu hasn’t started stressing herself over the perfection of her lines or the price points for commissions, just yet. “I have no obligation to draw. I just draw what I see.” She says, although admitting she still asks herself, “Is this what I want to do? I don’t want to lose the drive for day out,” as she becomes increasingly involved with her work. It isn’t the strictest of formulas, but for now Wu says, “I’m comfortable using what I like to work with.” Wu admits she “hasn’t experimented” much beyond these materials or what they can do. She had however learned to care for the weight of the paper and not draw on both sides, now with the possibility of “I might have to display this one day” weighing on her mind. with the possibility of “I might have to display this one day” weighing on her mind. Wu produces a sketchbook, 5.5″ x 8.5″, with a silver-sharpie skyline drawn across its front. Although the cover may depict Manhattan and with it New York’s iconic bridges, its first page is devoted to Wu’s beloved Boston. Originally from Massachusetts, the state features intermittently through the dozens of paintings, each given their own page and signed dutifully at the bottom. But before Wu can perfect her picture and temper the colors together until the right shade emerges, she has to pick a spot to draw. “You have to limit the space in which you can see. Look for where the picture is cropped” She says, holding the sketchbook up, to show a possible subject’s framing from her perspective several feet away. “You have to think what to show. A picture is as much about the details you leave out. What foliage you include.” Wu gestures at the expanse of green atop stick like branches that represents the treetops in a sketch of Bryant Park. As far as future topics, Wu has “an artillery of places” that she’s been meaning to paint. “Sometimes it’s ‘I’ve been here and I want to go again.’” Currently, Wu says, “I want to take advantage of temporality. 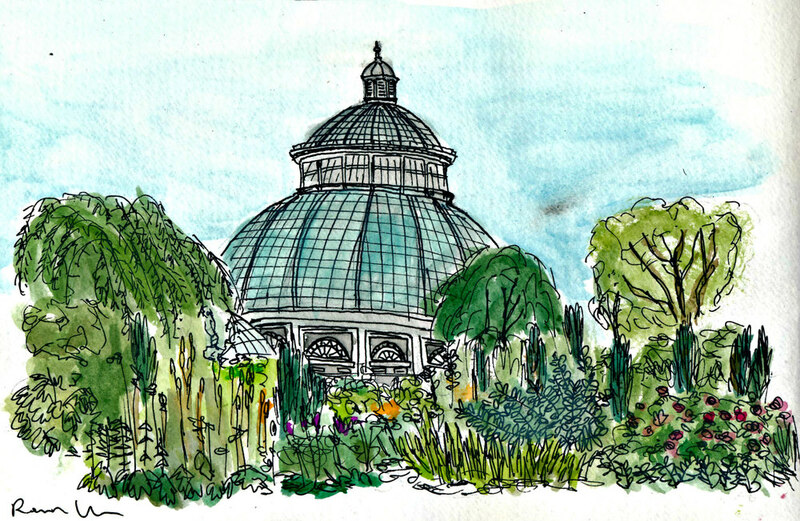 Like the fall colors.” Her painting of the New York Botanical Gardens highlights the canopy of greens and spring blooms that have since faded. It was in such a foreign city on a recent trip to China that Wu began her journey as a sketch artist and led to her current concentration in “live sketches,” as she calls them. “There’s something about Asian cities. Chinese landscapes. The density, the sheer number of people, the oppressive heat. [A city] growing at a rapid rate.” All this chaos, and perhaps its relative parallel to New York’s own writhing mass, peaked Wu’s attention. Wu is lucky to have found such a positive response given that the Internet and its comment sections can be unforgiving. She remembers one recent note, left lovingly on one of her posts. “It was in Spanish. I was like ‘What?’ I had to ask my friend to translate.” The message was of encouragement, unexpectedly from thousands of miles away. And word of Wu has definitely gotten out. 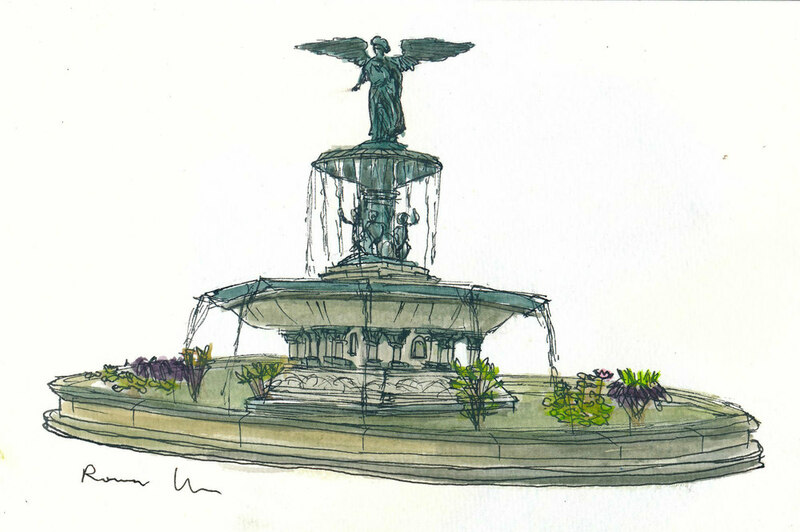 She recalls how interest “really kicked in over the summer.” A fateful re-posting (“re-gram”) of one of her illustrations by Central Park’s official Instagram account resulted in a surge of Likes, Re-grams, and additional followers. It was a watershed moment for Wu’s online popularity. “I could feel something was about to change.” She remembers. Most recently, Wu landed a gallery opening at Birch Coffee’s Upper West Side location. There, her artwork will be on display for friends, followers, and coffee drinkers alike. The show starts with an opening party on November 3rd, which comes at an opportune time, that week also containing Wu’s 21st birthday. With this opening approaching, Wu’s art has officially and, perhaps, irreversibly expanded beyond her personal use. “I don’t know where this is going,” she admits, but that’s not stopping her. 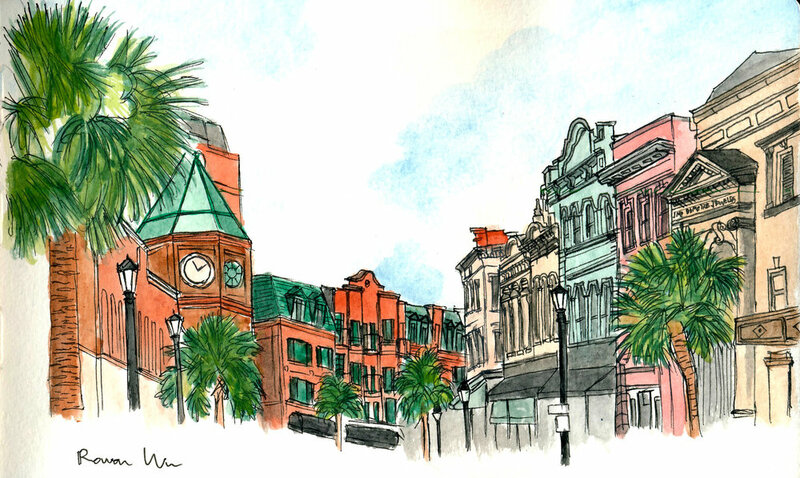 As she packs her watercolors and tools away, she nods, open to the possibility of stopping somewhere to sketch in-between errands and reading. For her it isn’t a chore or more work. “It’s the best kind of self-love.” She says. Zoe Marquedant is an MFA candidate in nonfiction at the graduate writing program of Columbia University’s School of the Arts.